Fun. are back on the road selling out shows again. 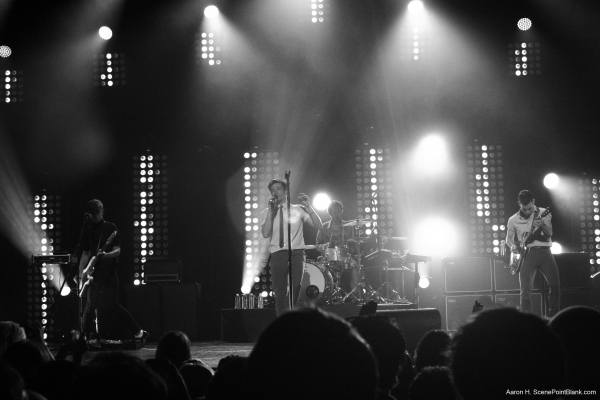 This time however, they didn't just sell out one show, but 3 nights at the illustrious Wiltern Theater in Los Angeles. Wow. This band has come a long way. Would they be able to fill the venue sonically as much as with their fans? A full house at The Wiltern makes it difficult to walk anywhere. The number of people there was a sight to see on its own, and every last one of them awaited Fun. 's presence. The lights dropped and Fun. walk out and jump into the mellow track, "Carry On." I didn't think I'd enjoy this song as an opener as much as many of the other tracks they've opened shows with, but it turned out to be a great way to start the show. 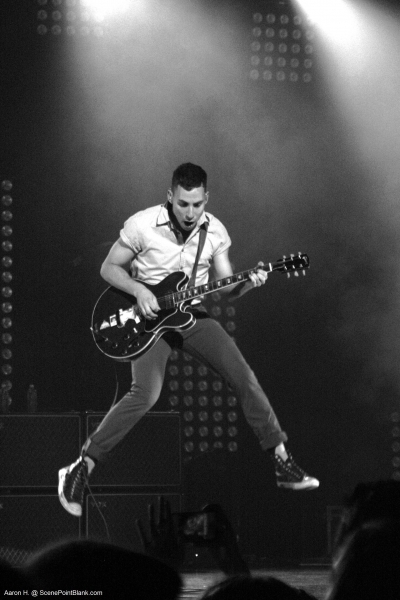 The song allowed the crowd to continue to build up some anticipation until the point that they could get rowdy--which hit the moment guitarist, Jack Antonoff, got to his solo. The fans really let loose as the band went into classics, "Walking the Dog" and "All The Pretty Girls." The night was off to a great start. The audience was in good spirits--minus the occasional obnoxious inebriate. The band was full of energy, full of smiles, and still full of charm. Nate was bouncing across the stage as usual. Jack was on the verge of breaking every single one of his strings, and Andrew never missed a note. They shared some stage banter and even went into an impromtu cover of "December, 1963." However they didn't complete it--despite the fans continuing on with the lyrics. Fun. jumped back and forth between albums, playing tracks like "At Least I'm Not As Sad" and "Roman Candle" from Aim & Ignite, and songs from Some Nights like, "Why Am I the One?" and "All Alone." The group reworked the fast paced, "It Gets Better," by getting rid of the opening drum machine and utilizing the guitars more for the mid-tempo intro. The band still maintained tradition by having the backing band walk off so Nate, Jack, and Andrew could perform "The Gambler,"--which was dedicated to Jack and Andrew's parents. They did throw in a few surprises though. During the bridge of "Barlights," confetti was shot out from all corners of the room and completely filled the venue. They also went into a cover (a fully planned out one this time) of The Rolling Stones', "You Can't Always Get What You Want." You know, they haven't done a single bad cover over the years. I wonder what they'll do in the future. Of course, the band couldn't leave without first doing the track that really put them on the map, "We Are Young." It's no surprise that the crowd went wild. After the band had left and returned for their encore, they blared out, "One Foot." Personally, a song I had been looking forward to the whole night. 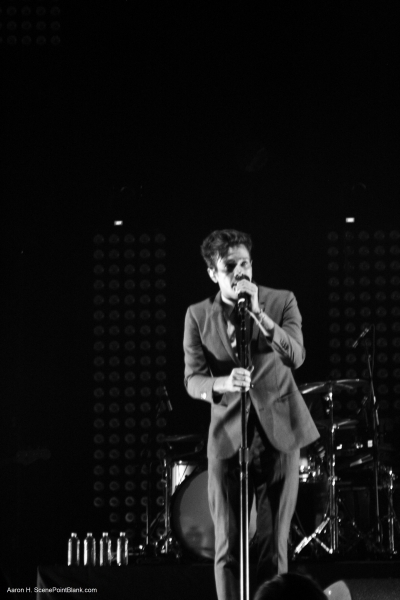 The crowd was causing the ground the shake, but not like they did as when they closed the show with "Some Nights." I've expressed my distaste for the autotune in the past, so I won't get into it, haha. A small highlight of the night was when Nate decided to hit the high note in the bridge on, "oh, come on!" As they closed out the night, balloons rained down, and some fans even decided to take some home as souvenirs. Everyone had a good time and went home happy. The people attending the remaining nights are in for a treat. If it's 3 sold out nights at The Wiltern now, I can only imagine where this band will be playing the next time they come around. Somewhere they'll surely still pack to the brim no doubt. They've worked hard for their success and they deserve it.